Peaches and Greens is a really simple green smoothie taking just a few ingredients readily available most places during the summer and spring. All the ingredients come together to make a flavorful really silky delight. In fact, it’s so creamy I thought about calling it Peaches N Cream. 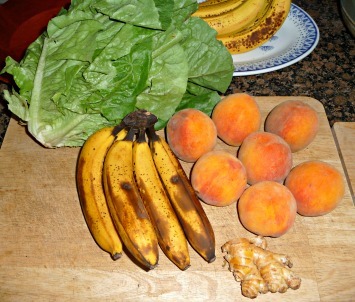 The romaine lettuce is mild enough that it doesn’t overpower the peach and banana flavor. 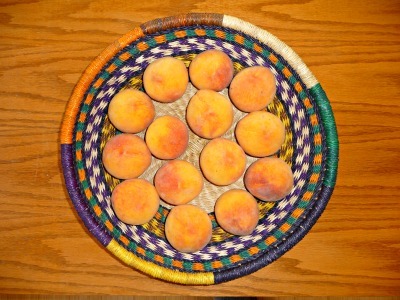 There’s nothing like a fresh ripe peach, unless it’s a small bowl full. They’re so juicy and bursting with flavor. 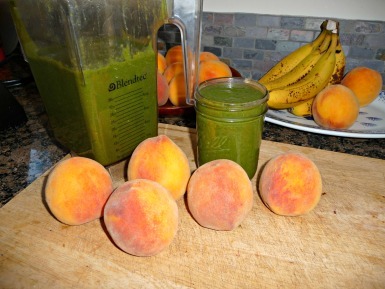 And that juicy peach flavor really comes through in this green smoothie. Romaine lettuce has good levels of omega 3’s, and the chia really boosts that and allows this smoothie to carry you a little longer. There’s lots of nutritional goodness in this one as well.